I’ve been working. Nice to have some writing to do that doesn’t have a deadline. Herein is a short report on my progress through the Tottering Stack. 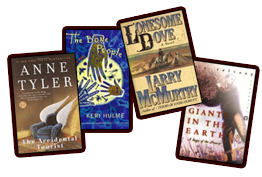 This entry was posted in The Tottering Stack and tagged Anne Tyler, Book review, Giants in the Earth, Keri Hulm, Larry McMurtry, Literature, Lonesome Dove, O. E. Rolvaag, The Accidental Tourist, The Bone People on January 20, 2014 by janetlong.